Is The Left Approaching a Kool-Aid Moment? We noted here the other day (“Propping Up Obama”) the agony of the left over Obama’s miserable performance of late. But there are other signs that leftism is falling apart just about everywhere. This is what happens when you run out of other people’s money. 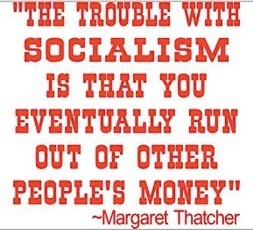 Funny how that always seems to happen to socialists. It’s what we call bad luck. Item: There’s suddenly a hot race for president of Brazil with the rapid ascent of a new Socialist Party candidate, Marina Silva, who replaced the previous boring party standard bearer who did the party a favor by dying in a plane crash. According to the Wall Street Journal, Silva would beat the incumbent president Dilma Rousseff of the Workers Party in a runoff. Wait—stop the tape! Brazil has a Workers Party and a Socialist Party? Why do you need both? I thought all socialist parties were on the side of workers, by definition. That’s why there’s always been a Socialist Workers Party, no? What next: The Judean People’s Front and the People’s Front of Judea? I guess this is what happens when you run out of other people’s money: thieves fall out among themselves on how to divide up the dwindling spoils. Should be fun to watch. Almost as much fun as watching Argentina thrash around—once the fourth richest nation in the world a century ago before the country caught the socialist bug. Maybe it was just bad luck, like those decades of Soviet grain harvests. Not to worry. I’m sure Venezuela or Cuba can send them foreign aid.